Please fill in every box with a single digit (0,1,2,3,4,5,6,7,8, or 9) or an intentional blank, indicated by "x." 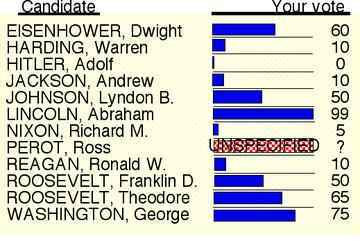 Advise giving your favorite candidate 99 and your least-liked one 00. Fill in one numbered box in each candidate's row (or none, if you intentionally wish to express no opinion about that candidate). Advise giving your favorite candidate 9 and your least-liked 0. > Punch one number per row. Same picture as for "optical scan machines," except that the blue squares now denote, not a filled-in optical scanner blob, but rather, a depressed lever! Incidentally, with punch cards (or computer displays) we could imagine continuum analog range voting by just using the horizontal location of the punched hole on an 0-99 horizontal scale, as your vote. That would be extremely simple, but I worry that analog votes would be more susceptible than digital (and hence unambiguous) votes to intentional misinterpretation. Fill in one numbered box in each candidate's tens-row & one numbered box in each candidate's units-row (or leave them both blank, if you intentionally wish to express no opinion about that candidate). Advise giving your favorite candidate 99 and your least-liked 00.